Photograph of West Point graduate Edwin McCormick, with a presentation date of 21 October 1874. 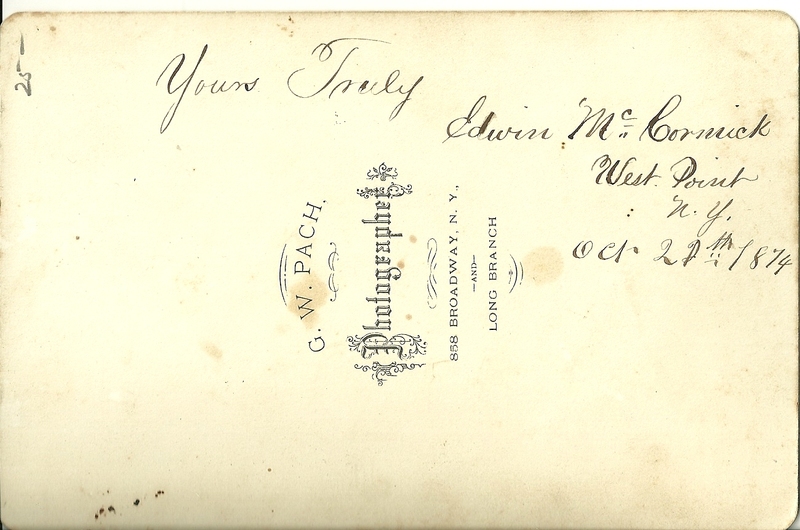 The photograph was presented to T. F Walsh. 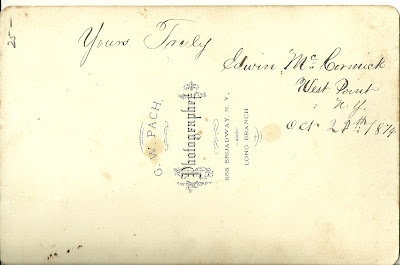 Edwin McCormick was born about August 1852 in New York, the son of Edwin and Charlotte (Lyons) McCormick. He was married twice and had children with both of his wives. His first wife was Sophia Dennison, who was born about 1855 in New York. I found a source online that claimed that Sophia Dennison was Sophia A. Dennison, born 28 November 1854, the daughter of Stephen Parker Dennison, born at Machias, Maine 3 August 1824, and Keziah Turner, born in England on 10 February 1827. This Sophia's father Stephen was a whaler in Maine who moved his family to the Hudson River in New York, apparently before Sophia was born, if this is the correct family. This Sophia, according to records in the Oakley Family Bible, was married to a James Wilson, about whom I know nothing, in 1873. She and James were not married long, if this is our Sophia. The date of death of this Sophia is 21 September 1892, which certainly fits. If you have information on this mystery, please leave a comment. It appears that Sophia died after the birth of Florence. In 1893 Edwin married a Margaret M., born about 1865 in Canada. Edwin McCormick, born about 1902 in New York. 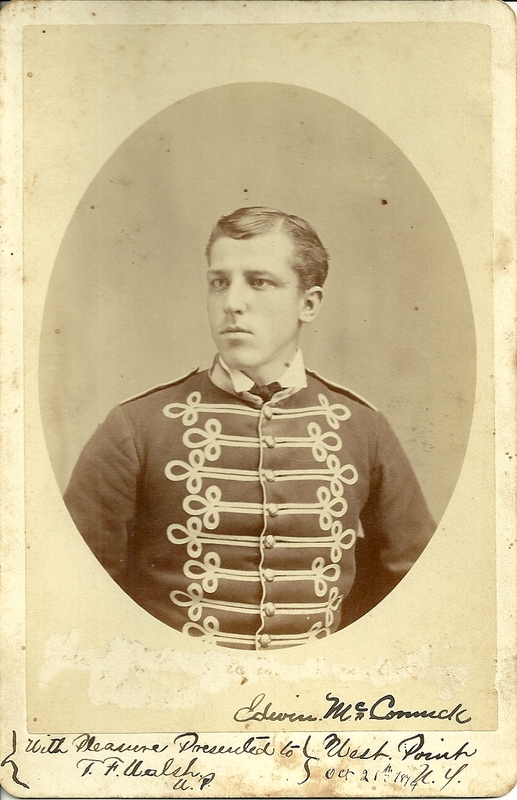 Edwin McCormick, from what I could gather, spent most, if not all, of his military life at West Point. He died on 17 May 1925 and is buried in Highland Falls, New York. If you have any additions, corrections or insights regarding any of this information, please leave a comment or contact me directly. Thanks! Thank you for taking the time to leave a comment. Would it be possible for you to provide a link to your website with Dennison information that I could insert in this post for the benefit of future readers? The Maine (not to mention whaling) connection is of special interest! I am the great grandson of Edwin McCormick, through his son Francis Thomas who married Irene B. Bartlett and had three children named Joseph, David, and Bert. My father is David Sr. According to our records Sophia's middle name was Arminta. Our records are she died Sept 23rd 1925. Edwin's second wife was Margaret Enright who died Oct 19th 1931. Her family was from Nova Scotia. There is some discrepancy over the info I was given by my father and the information here. He named Edwin and Margaret's children as Edwin, Francis, George and Florence. I will see if I can check that info and find a source. I want to thank you for placing this online, I would have never seen a photograph of my Great grandfather otherwise. Thanks for writing, David. I can only imagine the thrill you got when you came across your great grandfather's image. Thanks also for the additional information about Margaret Enright. I'd be interested in learning the names of her parents and where in Nova Scotia she was born.